A spirit was floating in another world’s dungeon, missing its memories. Eventually “he” learned to possess other creatures and using the bodies of the beasts in the dungeon, made his way to the outside world. Dragging a young female knight, a pretty young lady, and even a beautiful mercenary into the mix, our protagonist begins his great adventure in this world! An unique story. The MC is nothing like you've ever seen before. If this doesn't get 5/5, then those cliché Reincarnate / Transported to another world shouldn't even get more than 4/5. Though it doesn't seem like Transported to another world. The MC is just a spirit without memory. So far I haven't seen any modern world behavior from him. He doesn't even have a preset personality, just an innocent newborn learning about the world around him. He is an adventurer now. Although it's cliché, but a Pet-like adventurer is still unique. I feel as if all the other reviews cover the pros and cons of this story well. However, I wanted to discount the harem tag attached to this story from what I've read so far. As someone who despises harems, I would say so far this story doesn't look anything like a harem and doesn't give the impression of having the qualities of what makes me dislike harems. The story doesn't have a perverted MC, every supporting character isn't female (like many other harems), everyone isn't in... more>> love with the MC (most have their own relationships unlike other harems), the story focuses on the story of the MC being in a different world (unlike most harems that focus on the harem and not the story). Feels like a series of short stories that is linked by the existance that is the MC. The MC becomes a pet-like existance most of the time to the people within that arc. As the MC posses animals and monsters most of the time. The pet saves the day the human couple made out with each other, and the MC proceed to other arcs. Also, I dont see what part of this is harem. Atleast not yet. As he is in the position of the clever animal most of the time. I freaken love this series. I feel like at the start it was the very essence of a fantasy adventure story. The MC just wandered the fantasy world helping whoever he could. I didn't really care for the tournament arc or the getting chummy with the royal family part. Nor the whole entire well I won't say it. But I feel like he got something he really should not have been able to get that sort of messes up his whole passing helper vibe. But whatever I suppose it's fine. This story is lovable and the MC (Kou) is just like a little child in the beginning of the story but as he meet new people and learn more of this world and grows, he stay the same kindhearted person (still spirit) that likes to help people. With his act of kindness. He would save a little girl and bring back her precious brooch, save two instructors and change their lives forever, help a young woman to save her family reputation and many families live hood also bring her family... more>> together. He would meet a beautiful mercenary help them save hostages and train new members and become the core of their party. This story does deserve the Romance tag because here is my guess. When the beautiful mercenary met kou for the first time she could tell he wasn't a bad person just looking at his soul; therefore when he change bodies to a fake human body she thought he was cute and hug him when she found it was kou. 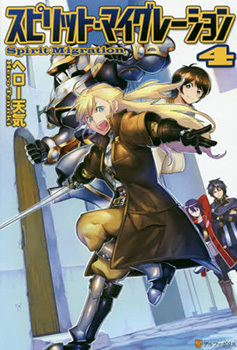 In the the cover of volume 6 you can see that Karen is hugging him. The story is interesting and fun to read. The MC is good, has an interesting and unique ability. Good at using his head. MC doesn't hold a grudge or anything. He's kind of innocent and cute, probably is or was a child. I'm even suspecting that MC is actually a girl because of his cute behavior... A trap maybe? What irks me aren't the MC or the story but 2 side characters. The prince may not be a bad guy, but he's just annoying with all his pushiness and advances on the Japanese girl. f**k.
Sayaka, the Japanese girl, is kinda retarded and unrealistic. Her situation reminds me of Nanahoshi from Mushoku Tensei but I prefer Nanahoshi who stays true to her goal of finding her way back home. Sayaka doesn't seem to have any goal or direction and is perfectly fine with letting others control her. She's even letting the prince kiss and touch her even though she doesn't seem to have feelings for the prince. Or at least she's not in love with the prince... yet. It's heading in that direction though. The prince is possessive and treating her like she's his. Maybe she can't resist because he's a prince, but she doesnt even try. I just think she's unrealistic for a modern teenage girl, especially if she starts falling for that pushy prince. Her first priority should be trying to find a way back home or at least be questioning why she's in that world. Like what would her friends and family think if she just marries the prince.. Simply put, its fun. Unique characters, fun setting, lighthearted story, this is a novel that is perfect for casual reading that doesn't take it way too seriously. Oh this is an unique one, it's adventure of what we would all an guardian spirit. The plot is simple, but realistically inclined by having actually solutions presented to the problems.